There’s nothing much less appetizing than cooking with stained, burnt cookware that has remnants of past meals clinging on for dear life. One of the most frustrating things about pots and pans is the cleaning process. Sometimes it just seems impossible to get them completely clean again. After only a few months they may start looking pretty shabby and it’s very tempting to just throw them out and get new, shiny and CLEAN pots. Aren’t they supposed to last longer than this? What’s the deal with ceramic cookware? Never underestimate the magical scrubbing and cleansing powers of salt. This household item is not only something you probably have conveniently stashed in your cupboards, it’s actually a very effective way to get stubborn stains to lift from ceramic cookware. Be sure to only use this technique on non-coated ceramic cookware to ensurt that you don’t damage the coating. 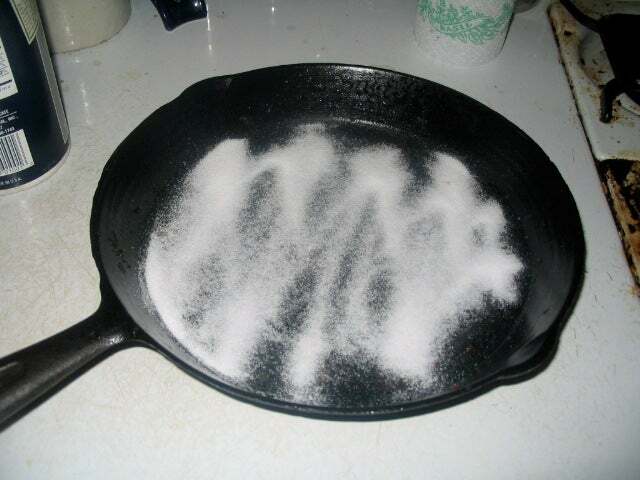 All you need to do is pour salt into the pan with a little water and use a sponge dipped in the salt to scrub the stains off. When you’re not baking with it, good old baking soda is known to be a great cleaning agent. We recommend pouring some baking soda into a damp pan (not full of water) and scrub it well with a brush or a sponge. This should loosen up burnt food and stains and leave your ceramic looking fresh and clean. One technique that seems to work quite well especially in the case of lots of food being stuck or burnt to the bottom of the pan, is boiling it. As soon as you’re finished cooking, pour some hot water into the pan along with some dish soap or another cleaning agent and let it come to a boil. Once it’s boiling you can use a cooking tool to check the pan to see if the food is loosening up. Once you can easily start removing the food, you can turn off the burner, scrape the pan (carefully) and leave it to cool before using a sponge and scrubbing brush to get the rest off. Be sure to not use a brush or sponge while it’s still hot because this could cause the tools to melt. We hate to be the one to recommend extreme measures but extreme pot cleaning issues call for extreme cleaners. When it comes to the really bad stains that won’t lift no matter what you try, we recommend that you soak the pot with oxi clean or a little bit of bleach and water. The sooner you do this after the stains are made, the better it will work. Be sure to thoroughly wash and rinse the ceramic cookware after using harsh chemicals to clean them. There are so many ways to clean the nastiness off of your ceramic pots and pans so don’t lose hope too soon before you try out some of these techniques. Another great thing you can do to prevent bad burns and stains is to cook with lower heat. It’s hard to do if you’re in a hurry but often, food comes out better when cooked with patience and on low heat. Many oils do not do well in higher heats and end up leaving ugly marks on the pan. But for those stains that you just cannot help, the above cleaning tricks should have you covered!